Objective: The objective of this study was to determine whether left ventricular (LV) myocardial deformation indices can detect subclinical abnormalities in Kawasaki disease convalescence. We hypothesized that subclinical myocardial abnormalities due to inflammation represent an early manifestation of the disease that persists in convalescence. Background: Myocardial inflammation has been described as a global finding in the acute phase of Kawasaki disease. Despite normal systolic function by routine functional measurements, reduced longitudinal strain and strain rate have been detected by echocardiography in the acute phase. Methods and Results: Peak systolic LV myocardial longitudinal, radial, and circumferential strain and strain rate were examined in 29 Kawasaki disease convalescent patients (15 males; mean [standard deviation] age: 11 [6.6] years; median interval from disease onset: 5.8 [5.4] years) and 10 healthy volunteers (5 males; mean age: 14 [3.8] years) with the use of cardiac magnetic resonance (CMR) feature tracking. Routine indices of LV systolic function were normal in both groups. Comparisons were made between normal controls and (i) the entire Kawasaki disease group, (ii) Kawasaki disease subgroup divided by coronary artery involvement. Average longitudinal and circumferential strain at all levels was lower in patients compared to normal controls. In subgroup analysis, both Kawasaki disease patients with and without a history of coronary involvement had similar longitudinal and circumferential strain at all levels and lower when compared to controls. There were lower circumferential and longitudinal values in Kawasaki disease patients with persisting coronary artery lesions when compared to those with regressed ones. Conclusion: In this CMR study in Kawasaki disease convalescent patients with preserved routine functional indices, we detected lower circumferential and longitudinal strain values compared to normal controls, irrespective of the coronary artery status. Although myocardial inflammation is a universal finding in Kawasaki disease, the routine echocardiographic measurements of left ventricular (LV) systolic function often derive normal., In a recent long-term follow-up cardiac magnetic resonance (CMR) study evaluating the cardiac function of patients with Kawasaki disease, no difference in cardiac function between patients and controls was observed, except in a subgroup of patients with ischemic heart disease due to severe coronary artery pathology. However, during the acute phase of Kawasaki disease, tissue Doppler interrogation of LV inflow velocities has revealed abnormal relaxation patterns and was associated with elevated levels of brain natriuretic peptide. Consistent with these findings, echocardiographic long-term abnormalities of LV size and function were reported. CMR feature tracking (CMR-FT) allows for the quantiative assessment of regional and global myocardial systolic and diastolic LV function. Evidence of its use in evaluating myocardial function in Kawasaki disease has been limited. The purpose of this study was to evaluate LV myocardial deformation indices in the detection of myocardial involvement in Kawasaki disease convalescence. We hypothesized that in Kawasaki disease convalescent patients, despite normal routine systolic function indices as assessed by ejection fraction, end diastolic and end systolic volumes indexed to body surface area, CMR-FT-derived indices of global LV deformation indices will be abnormal. This is the first study to apply CMR-FT in Kawasaki disease patients and to examine deformation indices in this population in the convalescent phase. The study was conducted at Evelina Children's Hospital, London. Patients with a history of Kawasaki disease who had undergone a CMR examination between September 2010 and December 2013 were retrospectively included if they were in the convalescent phase, as termed by the resolution of all clinical signs and the normalization of laboratory abnormalities and had normal routine functional indices on CMR. Medical records were reviewed to collect clinical characteristics of the patients. Normal reference examinations were derived form previous patients who had undergone assessment for cardiomyopathy family screening, with a subsequent normal clinical and laboratory examination. Informed consent was obtained from patients and healthy volunteers. The study was approved by the Ethics Committee of our hospital (Ethics Reference No: 09/H0802/036), in accordance with the ethical guidelines of the 1975 Declaration of Helsinki as reflected in a priori approval by the institution's Human Research Committee. All patients and controls had undergone CMR at 1.5-T MR field strength (Intera, Philips Healthcare, Best, the Netherlands). Electrocardiography (ECG)-gated two-dimensional (2D) steady-state free precession images were acquired for functional assessment. To assess fibrosis, late gadolinium enhancement images (inversion recovery turbo fast low-angle shot) were acquired after 10 min. An ECG-gated 3D steady-state free precession sequence with T2 and fat saturation prepulses was used to visualize the coronary arteries in a whole-heart approach. Imaging was performed under general anesthesia, if necessary, with continuous intravenous infusion of remifentanil with the use of a CMR safe anesthesia delivery system (Aestiva/5; GE Healthcare, Waukesha, Wisconsin, USA) with controlled ventilation (routine protocol for young or uncooperative children at our institution). CMR studies were analyzsed by two cardiologists involved in the study (KB, PH) blinded to the patient clinical characteristics. The standard cine 2D steady-state free precession short axis was used to evaluate the right and LV ejection fractions of each patient. Myocardial wall motion was qualitatively analyzed and classified as normal or abnormal, which includes hypokinetic, dyskinetic, or akinetic wall segments. The evaluation of scar tissue was performed from the late gadolinium enhancement images, based on a 5-standard deviation (SD) threshold above the mean remote myocardial signal and was categorized as subendocardial (<50% wall thickness) or transmural (>50% of wall thickness). A 16-segment model was used for motion and scar analysis. Magnetic resonance angiography images were evaluated for the presence of aneurysms, stenosis, and thrombi of the main epicardial coronary arteries. An abnormal coronary artery was defined according to criteria established by the 1984 Japanese Ministry of Health criteria. Analyses of myocardial deformation were performed from 2D strain data using FT imaging with dedicated software (Circle Cardiovascular Imaging 4.2, Calgary, Canada). All three directional (longitudinal, circumferential, and radial) data of myocardial deformation were measured in basal, mid, and apical levels. In analyzing deformation, strain and systolic strain rate were calculated by the measured values from six segments (anteroseptal, anterior, anterolateral, inferolateral, inferior, and inferoseptal segments) in the respective three directions at three levels of the myocardial wall, with delineation of the endocardial and epicardial borders [Figure 1]. All data were reported as mean (SD). Statistical analysis was performed using SPSS software (SPSS Inc., Chicago, IL, USA, version 21.0). Correlation analysis was assessed using Pearson's correlation. Biventricular dimensions were normalized to the body surface area, which was calculated according to the Mosteller formula: √height (cm) × weight (kg)/3600. One-way ANOVA and unpaired Student's t-test were used to compare demographic characteristics and to compare strain and strain rate. The coefficient of variation was calculated to study the variability of the measurements. Intra- and inter-observer variability were assessed using the intraclass correlation coefficient and were 0.97 and 0.91, respectively. P < 0.05 was considered statistically significant. Twenty-nine patients with a history of Kawasaki disease and normal ejection fraction (15 males; mean age: 11 [6.6] years, range 3–27 years; mean LV ejection fraction: 63% ) were included. All patients fulfilled the diagnostic criteria for Kawasaki disease, which required more than four principal criteria and fever of duration longer than 4 days. All patients had undergone echocardiographic examination on admission and received optimal treatment including intravenous immunoglobulin infusion therapy during the acute phase. Patients were diagnosed with Kawasaki disease at a median age of 5.2 (3.6) years (range, 1–11 years), and the median interval to CMR examination was 5.8 (5.4) years (range, 1–16 years). Seven patients (24%) had impaired ventricular shortening fraction by echocardiography during the acute phase. During convalescence, all patients had clinically recovered completely, were asymptomatic, and routine CMR indices of LV systolic function were normal for both groups, without any wall motion abnormality. All patients were free of any comorbidity at the time of the examination. No patient presented myocardial fibrosis on late gadolinium enhancement images. For subgroup analyses, patients were divided on the basis of previous coronary artery involvement and persistent artery lesions. [Table 1] summarizes the demographic and routine CMR functional characteristics of the included patients and controls. A reference control group of ten healthy volunteers (5 males; mean age: 14 (3.8) years, range: 6–19 years) with normal ECG and no evidence of cardiac disease were identified for comparison analysis. Mean LV ejection fraction in the controls was 63% (5.7), similar to that observed in Kawasaki disease patients (65% ) [Table 1]. Compared to controls, Kawasaki disease patients had lower myocardial global longitudinal S (16.4 [5.4] vs. 18.9 [7.8]) and SR (1.4 [0.6] vs. 1.5 [0.8]). 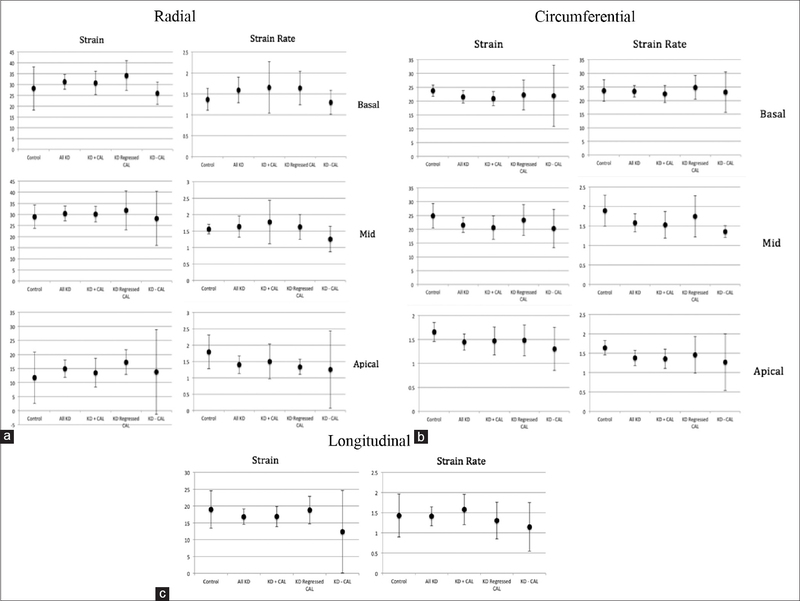 Similarly, lower circumferential basal, midventricular, and apical strain and strain rate between all Kawasaki disease patients and normal controls were observed (23.7 [5.5] vs. 28.2 [13.9]; 1.5 [0.4] vs. 1.4 [0.4]; 21.1 [5.5] vs. 23.8 [2.9]; 1.4 [0.5] vs. 1.7 [0.3]; 21.7 [7.0] vs. 24.9 [6.2]; and 1.6 [0.6] vs. 1.9 [0.6]). The above differences between Kawasaki disease group and controls in strain and strain rate values did not reach statistical significance. There was no difference in average radial basal, midventricular, and apical strain and strain rate (31.2 [8.3] vs. 28.2 [13.9]; 30.5 [8.1] vs. 29.0 [7.3]; 14.9 [7.4] vs. 11.7 [2.8]; 1.6 [0.7] vs. 1.4 [0.4]; 1.7 [0.8] vs. 1.6 [0.2]; 1.4 [0.7] vs. 1.8 [0.7], respectively) [Table 2] and [Figure 2]. Comparisons were made between Kawasaki disease patients subdivided based on the history and persistence of coronary artery involvement [Table 2] and [Figure 2]. When we compared patients with coronary artery lesions during the acute phase (n = 24) with those without coronary artery lesions during the acute phase (n = 5), no significant differences were found although lower basal radial strain and strain rate (26 [3.2] vs. 31.8 [8.6]; 1.3 [0.2] vs. 1.7 [0.8]), apical circumferential strain and strain rate (17.4 [4.0] vs. 21.7 [7.0]; 1.4 [0.1] vs. 1.6 [0.6]), and longitudinal strain and strain rate (12.8 [6.8] vs. 17.2 [4.9] vs. 1.5 [0.6]) were observed in patients without previous coronary involvement. When Kawasaki disease patients with previous coronary involvement were subdivided into those with and those without persistent coronary artery lesions, lower radial, circumferential, and longitudinal strain and strain rate were observed in the first group. Patients with persistent coronary artery lesions had lower average basal radial and circumferential strain and strain rate(30.3 [8.0] vs. 34.1 [9.0], 1.6 [0.9] vs. 1.7 [0.6]; 22.0 [4.7] vs. 24.9 [5.7], 1.5 [0.5] vs. 1.5 [0.4], respectively). Similarly, lower average apical radial and circumferential strain and strain rate were observed(15.6 [6.3] vs. 17.3 [5.7], 1.5 [0.8] vs. 1.4 [0.3]; 21.0 [7.6] vs. 24.5 [8.5], 1.6 [0.6] vs. 1.8 [0.7]). Longitudinal strain and strain rate were also lower in the group of Kawasaki disease patients with persistent coronary artery lesions (16.2 [4.5] vs. 18.8 [5.4], 1.5 [0.6] vs. 1.3 [0.6]). However, no statistically significant difference was shown between the two groups. Young adults in Japan have presented with ventricular tachycardia in the setting of left heart failure, decades following a missed Kawasaki disease insult. Thus, acute vasculitis and myocarditis associated with the disease may lead to a complex set of cardiovascular problems later in life. The guidelines state that cardiovascular symptoms in Kawasaki disease patients only begin to appear two decades following the onset of the acute disease. This finding has been supported by autopsy and biopsy studies showing that almost all patients had some signs of myocarditis, pericarditis, or valvulitis. Yonesaka et al. reported myocardial changes including hypertrophy, degeneration of myocytes, and interstitial fibrosis in the majority of biopsies obtained at least 3 years after, at various time points after the acute illness and their presence was more frequent in patients who had suffered coronary artery aneurysms during the acute phase. Yutani et al. had previously found myocardial abnormalities including lymphocyte and plasma cell infiltration, myocardial fibrosis, and disarray of myocardial fibers in Kawasaki disease convalescent patients. Consistent with the pathological findings, echocardiographic long-term abnormalities of LV size and function were reported, although conventional myocardial indices in Kawasaki disease have been shown to remain within normal range in the long-term follow-up, except for cases of significant coronary artery involvement with myocardial ischemia or infarction. Decreased ventricular contractility and abnormal relaxation may be the consequences of antecedent myocardial inflammation. Overall, however, the existing evidence of myocardial deformation studies in Kawasaki disease is poor. With the use of 2D speckle tracking imaging, South Korean investigators reported significantly decreased longitudinal strain but normal strain rate in both basal and midmyocardium in fifty children with acute Kawasaki disease, despite normal systolic LV function by routine echo measures, suggesting that myocardial deformation indices may be more sensitive indicators of myocardial inflammation. More recently, with the use of velocity vector imaging-derived myocardial deformation indices in 32 Kawasaki disease patients (66% male, mean age (SD): 24  months), it was shown that longitudinal LV myocardial strain and strain rate were reduced despite normal LV systolic function by routine echocardiographic measurements. In subgroup analyses, compared with controls, both longitudinal and circumferential strain were decreased in the groups with coronary artery disease and treatment resistance, but not in Kawasaki disease patients without coronary artery lesions or in patients without treatment resistance. In our study, overall, Kawasaki disease patients were shown to have lower circumferential and longitudinal strain compared with age-matched normal controls, a measure of wall thickening and myocardial deformation in the long axis, respectively. In subgroup analysis, both average longitudinal and circumferential strain were similar in Kawasaki disease patients irrespective of the history of coronary involvement and decreased when compared with controls. However, when Kawasaki disease patients with coronary artery lesions were compared with each other, a more pronounced decrease was shown in those with versus those without persisting coronary artery lesions. Our findings are consistent with previous echocardiographic studies in which subclinical circumferential and longitudinal deformation abnormalities, but not radial ones, were shown in the acute phase of Kawasaki disease. If chronic cardiomyopathy may indeed occur, this process would be expected to ultimately result in subtle ventricular dysfunction. In addition, it is not surprising that no difference reached statistical significance since only patients with preserved routine functional indices were included in the study. Although there was a difference in strain between the Kawasaki disease and control group, the strain rate measurements were similar between all groups and its clinical utility in Kawasaki disease diagnosis in individual patients is limited, as was also shown in previous echocardiographic studies. We did not observe late enhancement caused by myocardial fibrosis in any of the patients, as was expected in the absence of any history of myocardial infarction in the acute phase, a finding that is in agreement with previously published evidence in Kawasaki disease. Novel CMR techniques, such as T1 mapping quantification, could potentially offer more thorough appreciation of possible prior myocarditis-related damage with diffuse and limited nature and its correlation to CMR-FT abnormalities. Fifteen patients and none of the controls were studied under general anesthesia (remifentanil). Although remifentanil has been described to transiently affect the hemodynamic properties, it has not been directly linked to changes in systolic and diastolic performance. In addition, reduced indices of myocardial performance were observed in all patients, irrespective of the administration of anesthesia. Both echocardiographic speckle-tracking imaging and CMR-FT currently offer reproducible measurements of strain values that can be applied in different clinical scenarios to assess LV and right ventricular function. CMR has an established and continuously expanding role in tissue characterization and it is the modality of choice for accurate evaluation of global function using volumetry. 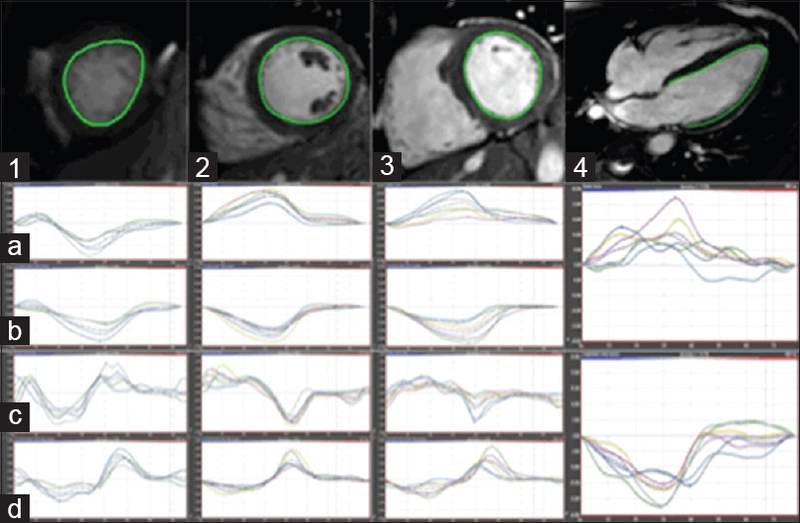 CMR-FT is a method of assessing myocardial deformation from routinely acquired cine images and has recently been validated for global and segmental strain analysis in healthy volunteers. This is consistent with other studies where strain imaging has been shown to be useful in the early detection of myocardial involvement in asymptomatic patients with diabetes, systemic sclerosis, amyloidosis, and doxorubicin-induced cardiomyopathy.,,, CMR strain and strain rate imaging may be a more sensitive indicator of myocardial involvement also in Kawasaki disease patients, both in the acute and convalescent phases. To our knowledge, this is the first study to apply CMR-FT in Kawasaki disease patients. Despite our observations, long-term cardiology assessment seems reasonable because of the risk of possible deterioration, which for the moment may not be estimated accurately. CMR may be suitable for serial evaluation, combining coronary artery surveillance and functional evaluation in the context of a single examination without the use of radiation or an invasive procedure. Limitations of the study were: (1) the retrospective design of the study (2) the lack of long-term follow-up CMR-FT values, especially in the acute phase of the disease which would permit per patient comparison, and (3) although the number of patients is typical for similar CMR studies, the power of the study may be inadequate to detect statistical significance in subgroup analysis. In Kawasaki disease convalescent patients with preserved conventional functional indices, a reduction in circumferential and longitudinal strain irrespective of the coronary artery status was observed with the use of CMR-FT, compared to normal controls. This may be a sequel of myocardial inflammatory involvement during the acute phase of the disease. Strain rather than strain rate proved more effective in the detection of subclinical functional abnormalities in this population. The authors acknowledge financial support from the Department of Health through the National Institute for Health Research (NIHR) comprehensive Biomedical Research Centre award to Guy's and St. Thomas' NHS Foundation Trust in partnership with King's College London and King's College Hospital NHS Foundation Trust. The Division of Imaging Sciences receives also support as the Centre of Excellence in Medical Engineering (funded by the Welcome Trust and EPSRC; Grant Number WT 088641/Z/09/Z) as well as the BHF Centre of Excellence (British Heart Foundation award RE/08/03). Newburger JW, Takahashi M, Gerber MA, Gewitz MH, Tani LY, Burns JC, et al. Diagnosis, Treatment, and Long-Term Management of Kawasaki Disease: A Statement for Health Professionals From the Committee on Rheumatic Fever, Endocarditis, and Kawasaki Disease, Council on Cardiovascular Disease in the Young, American Heart Association. Pediatrics 2004;114:1708-33. Rowley AH, Shulman ST. Recent advances in the understanding and management of Kawasaki disease. Curr Infect Dis Rep 2010;12:96-102. Nagasawa H, Arakaki Y, Yamada O, Nakajima T, Kamiya T. Longitudinal observations of left ventricular end-diastolic dimension in children using echocardiography. Pediatr Cardiol 1996;17:169-74. Takeuchi D, Saji T, Takatsuki S, Fujiwara M. Abnormal tissue doppler images are associated with elevated plasma brain natriuretic peptide and increased oxidative stress in acute Kawasaki disease. Circ J 2007;71:357-62. Hiraishi S, Yashiro K, Oguchi K, Kusano S, Ishii K, Nakazawa K. Clinical course of cardiovascular involvement in the mucocutaneous lymph node syndrome. Relation between clinical signs of carditis and development of coronary arterial aneurysm. Am J Cardiol 1981;47:323-30. Kanegaye JT, Wilder MS, Molkara D, Frazer JR, Pancheri J, Tremoulet AH, et al. Recognition of a Kawasaki disease shock syndrome. Pediatrics 2009;123:e783-9. Tacke CE, Kuipers IM, Groenink M, Spijkerboer AM, Kuijpers TW. Cardiac magnetic resonance imaging for noninvasive assessment of cardiovascular disease during the follow-up of patients with Kawasaki disease. Circ Cardiovasc Imaging 2011;4:712-20. Kurotobi S, Kawakami N, Shimizu K, Aoki H, Nasuno S, Takahashi K, et al. Brain natriuretic peptide as a hormonal marker of ventricular diastolic dysfunction in children with Kawasaki disease. Pediatr Cardiol 2005;26:425-30. Anderson TM, Meyer RA, Kaplan S. Long-term echocardiographic evaluation of cardiac size and function in patients with Kawasaki disease. Am Heart J 1985;110(1 Pt 1):107-15. Wu L, Germans T, Güçlü A, Heymans MW, Allaart CP, van Rossum AC. Feature tracking compared with tissue tagging measurements of segmental strain by cardiovascular magnetic resonance. J Cardiovasc Magn Reson 2014;16:10. Welfare JMoHa. Research Committee on Kawasaki Disease. Report of Subcommittee on Standardization of Diagnostic Criteria and Reporting of Coronary Artery Lesions in Kawasaki Disease; 1984. Matsuura H, Ishikita T, Yamamoto S, Umezawa T, Ito R, Hashiguchi R, et al. Gallium-67 myocardial imaging for the detection of myocarditis in the acute phase of Kawasaki disease (mucocutaneous lymph node syndrome): The usefulness of single photon emission computed tomography. Br Heart J 1987;58:385-92. Kao CH, Hsieh KS, Wang YL, Chen CW, Liao SQ, Wang SJ, et al. Tc-99m HMPAO labeled WBC scan for the detection of myocarditis in different phases of Kawasaki disease. Clin Nucl Med 1992;17:185-90. Nakano H, Ueda K, Saito A, Nojima K. Left ventricular systolic function in children with coronary arterial lesion following Kawasaki disease. Heart Vessels 1985;1:89-93. Moran AM, Newburger JW, Sanders SP, Parness IA, Spevak PJ, Burns JC, et al. Abnormal myocardial mechanics in Kawasaki disease: Rapid response to gamma-globulin. Am Heart J 2000;139(2 Pt 1):217-23. Newburger JW, Sanders SP, Burns JC, Parness IA, Beiser AS, Colan SD. Left ventricular contractility and function in Kawasaki syndrome. Effect of intravenous gamma-globulin. Circulation 1989;79:1237-46. Yagi S, Tsuda E, Shimizu W, Kurita T, Seguchi O, Nonogi H, et al. Two adults requiring implantable defibrillators because of ventricular tachycardia and left ventricular dysfunction caused by presumed Kawasaki disease. Circ J 2005;69:870-4. Guidelines for diagnosis and management of cardiovascular sequelae in Kawasaki disease (JCS). J Cardiol 2004;43:263-83. Yonesaka S, Takahashi T, Eto S, Sato T, Otani K, Ueda T, et al. Biopsy-proven myocardial sequels in Kawasaki disease with giant coronary aneurysms. Cardiol Young 2010;20:602-9. Yutani C, Go S, Kamiya T, Hirose O, Misawa H, Maeda H, et al. Cardiac biopsy of Kawasaki disease. Arch Pathol Lab Med 1981;105:470-3. Yu JJ, Choi HS, Kim YB, Son JS, Kim YH, Ko JK, et al. Analyses of left ventricular myocardial deformation by speckle-tracking imaging during the acute phase of Kawasaki disease. Pediatr Cardiol 2010;31:807-12. McCandless RT, Minich LL, Wilkinson SE, McFadden ML, Tani LY, Menon SC. Myocardial strain and strain rate in Kawasaki disease. Eur Heart J Cardiovasc Imaging 2013;14:1061-8. Mavrogeni S, Bratis K, Karanasios E, Georgakopoulos D, Kaklis S, Varlamis G, et al. CMR evaluation of cardiac involvement during the convalescence of Kawasaki disease. JACC Cardiovasc Imaging 2011;4:1140-1. Morton G, Schuster A, Jogiya R, Kutty S, Beerbaum P, Nagel E. Inter-study reproducibility of cardiovascular magnetic resonance myocardial feature tracking. J Cardiovasc Magn Reson 2012;14:43. Galderisi M, de Simone G, Innelli P, Turco A, Turco S, Capaldo B, et al. Impaired inotropic response in type 2 diabetes mellitus: A strain rate imaging study. Am J Hypertens 2007;20:548-55. D'Andrea A, Stisi S, Caso P, Uccio FS, Bellissimo S, Salerno G, et al. Associations between left ventricular myocardial involvement and endothelial dysfunction in systemic sclerosis: Noninvasive assessment in asymptomatic patients. Echocardiography 2007;24:587-97. Bellavia D, Abraham TP, Pellikka PA, Al-Zahrani GB, Dispenzieri A, Oh JK, et al. Detection of left ventricular systolic dysfunction in cardiac amyloidosis with strain rate echocardiography. J Am Soc Echocardiogr 2007;20:1194-202. Migrino RQ, Aggarwal D, Konorev E, Brahmbhatt T, Bright M, Kalyanaraman B. Early detection of doxorubicin cardiomyopathy using two-dimensional strain echocardiography. Ultrasound Med Biol 2008;34:208-14.